With the holiday season approaching and black Friday only a few days away, it’s time to start lining out this year’s holiday shopping list. Instead of the sea of flashy packaging, cheap plastic toys, and brain-numbing video games, make this year’s gift really bring your kids some excitement. 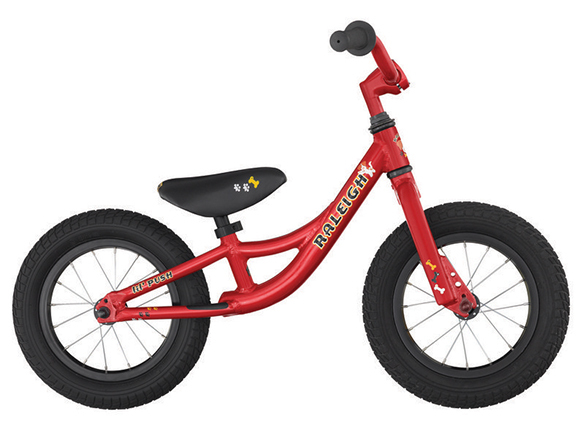 Regardless of their age or size, Raleigh Bicycles has the right bike for your little ones that will bring them years of enjoyment, while holding up to their abuse. A relatively new type of kids' bike has been gaining popularity amongst first timers – the kick or scoot bike. The kick bike is essentially a pedal-less bike that teaches children balance as they scoot and glide like a big kid without training wheels. Raleigh’s Lil’ Push is constructed of durable aluminum and features real 12-inch wheels with spokes and air-inflated tires. 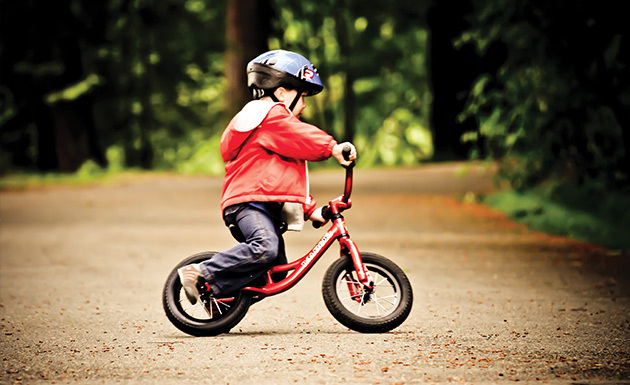 Once your child has mastered the art of two-wheeled balance, you can forget the training wheels when it’s time to upgrade to pedals and brakes. For more traditional kids' bikes, the 12-inch-wheeled Cupcake and MXR Micro for ages 2 to 5 are the perfect tools for those young, aspiring riders. Both bikes are equipped with training wheels and coaster brakes for those little ones who may need a little more practice learning balance, but who still want to drop the hammer. 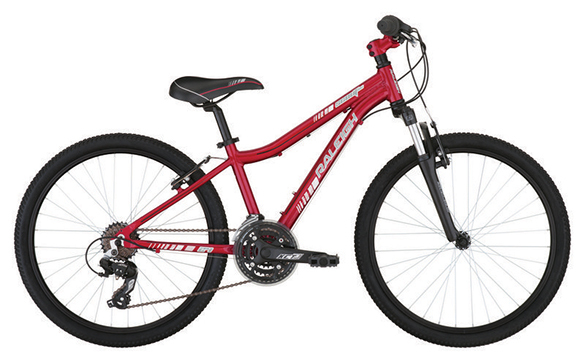 For bigger kids, ages 9 to 12, Raleigh has a great line of 24-inch-wheeled bikes that are perfect for jumping curbs, cruising the neighborhood and getting to school. The Scout XC is Raleigh’s most capable kids’ bike that features a full 21-speed drivetrain, powerful breaking power from handlebar mounted V-brakes and even a snazzy SR Suntour XTC suspension fork to soak up the bumps. The Scout XC is a miniature cross-country mountain bike for younger riders who have mastered the asphalt and want to explore trails. 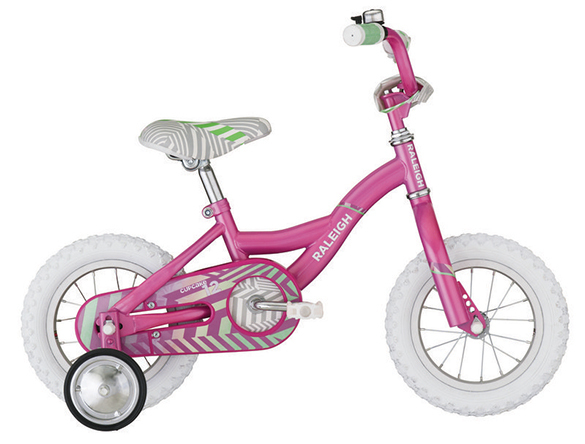 In addition to the previously mentioned bikes, Raleigh has a full line to match every age, size and ability. Because we care about the safety of our young bikers, we work with an independent test lab to guarantee all of our bikes and components are free of harmful chemicals and meet all required safety standards. This ensures our kids’ bikes are as safe to ride as they are fun. The gift of a bicycle is one that can lead to a lifetime passion, full of long-term health benefits. Let Raleigh Bicycles be the one to initiate or continue the passion of cycling for your family and loved ones this holiday season.